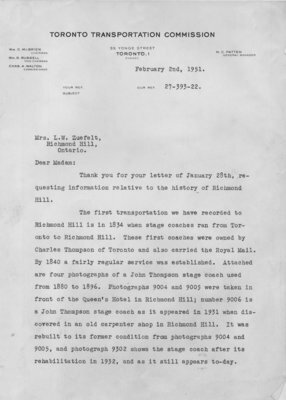 A letter of the Toronto Transportation Commission to Mrs. L.W. Zuefelt concerning her request of information related to the history of Richmond Hill. Mrs. L.W. Zuefelt, Richmond Hill, Ontario. Thank you for your letter of January 28th, requesting information relative to the history of Richmond Hill. The first transportation we have recorded to Richmond Hill is in l834 when stage coaches ran from Toronto to Richmond Hill. These first coaches were owned by Charles Thompson of Toronto and also carried the Royal Mail. By 1840 a fairly regular service was established. Attached are four photographs of a John Thompson stage coach used from l880 to 1896. Photographs 9004 and 9ОО5 were taken in front of the Queen’s Hotel in Richmond Hill; number 9006 is a John Thompson stage coach as it appeared in 1931 when discovered in an old carpenter shop in Richmond Hill. It was rebuilt to its former condition from photographs 9004 and 9ОО5, and photograph 9302 shows the stage coach after its rehabilitation in 1932, and as it still appears to-day. On November 20th, 1896, the Metropolitan Railway Company ran the first electric street car as far north as the construction work on the Lake Simcoe line then permitted, and, until completion of the overhead, was drawn by horse into the Village itself. On May 2nd, 1897 the electric operation was completed and street cars ran into the Village. The Metropolitan Railway Company was taken over in September 1922, by the City of Toronto, and turned over to the Hydro-Electric Power Commission (of Ontario) for operation. On January 12th, 1927, the City turned the management of the railway over to the Toronto Transportation Commission. On March 15th, 1930, operation of the Metropolitan Railway Company street cars was discontinued and the line serviced by buses of Gray Coach Lines, Limited, until July 17th, 1930, when North Yonge Railways was inaugurated and street cars began operating from the City Limits to Richmond Hill. I am attaching photographs numbers 74-62 and 7814 which might be of interest to you. Street car operation was discontinued on October 9th, 1948, and replaced by buses on October 10th, 1948, and the track later removed.